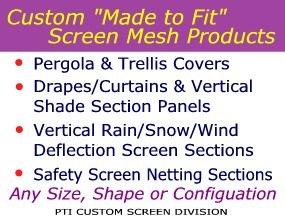 Custom shade screen drapes, curtains and vertical sections give shade and protection on patio, porch, balcony, deck and elsewhere when and where you need it. Sliding and Rollup curtains, used for protection from the sun, provide the ultimate in comfort and versatility on your porch, patio, deck, balcony, pergola, trellis, gazebo or sun room. They also provide rain, snow, insect and wind blown debris protection. These shade screen curtains inherit the same visual see through and privacy properties of the shade screen material from which they are made. Sliding curtains fold back like drapes and are best suited for long runs or wherever in/out access is desired. They can be constructed to pull back to one side or made in pairs to meet in the middle with a small overlap. Short sections (no more than three to four foot wide) can be hung by hooks over a tight cable without the cable deflecting from the weight of the curtain. Wider sections need to be hung on a metal curtain track in order to slide smoothly and maintain shape. The metal track can be curved to allow the curtain to go around corners. Sliding curtains have the advantage of being "doorways" when drawn shut. All that is needed is to simply push the curtain back from one side (or separate the pairs) and you have access in or out. Roll Up / Roll Down Curtains (roller curtains) are ideal for sections less than sixteen feet wide and are filling an area where you generally don't need passageway in or out. Wider areas can be covered with a set of two curtains. However, an air gap of about one inch will exist between the two. Roller curtains are often used when coverage is wanted only down to a railing or to a planter box. Due to the fact that they are vulnerable to wind whip, making preparations to be able to keep the bottom corners tied down is a good precaution. Hemmed sections of shade screen with grommets in the edges are not only handy to create temporary shade, but also very useful to fill sections where movable curtains are not practical or needed. 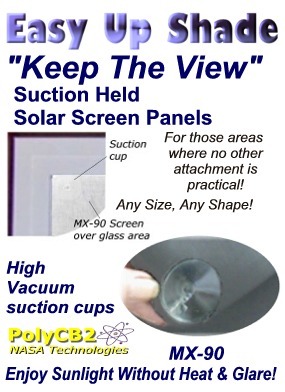 The visibility through shade screen allows you to permanently mount sections without spoiling your outward view. You can have the advantages of high density or low density screen mesh material anywhere it is needed. With the versatility of "any shape, any size", outdoor living in a shade screen enclosed and protected environment is entirely feasible.